Okay friends, this is for anyone who mistakenly believes that all our meals are elaborately fancy. They’re not. 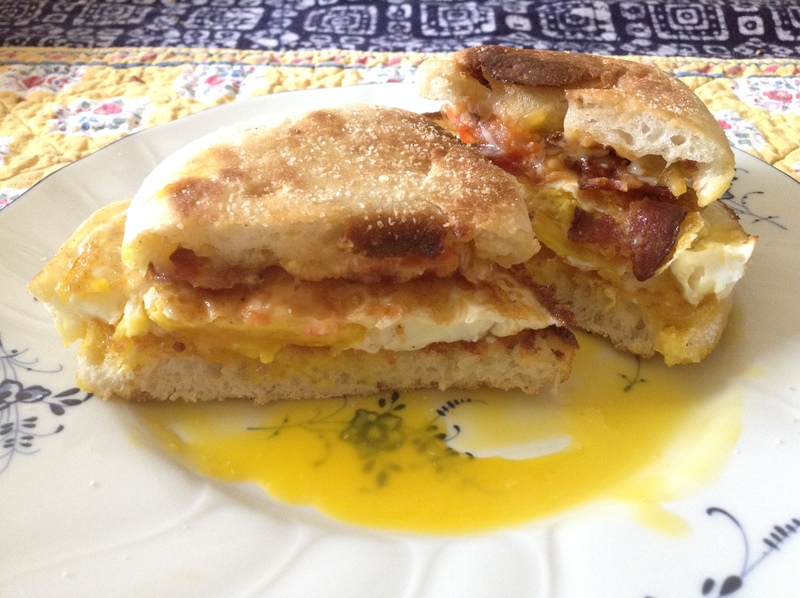 Sometimes I just want a simple fried egg sandwich. (Even for lunch, or dinner – who doesn’t love brunch or brinner??? Not this girl!) But I also can’t help myself; if we have the ingredients on hand, you bet’yer britches that I’m gonna’ jazz it up a bit. Place your bacon on the butter free part (it’s okay if it gets a little buttery, I’m just trying to pretend that maybe this is a healthy meal). Crack open your eggs into the hot butter and fry, again, to your liking. I prefer mine with runny yokes (drool). No lie, I treat that over-flowing-yolk like a 5 star dressing, using my sandwich to wipe up every last drop. Ben and Milo like theirs fried hard. So I put their eggs in first, using the shell to break and gently scramble the yoke a little (a trick I learned in college from my dear friend Christina). Next, I gently drop my egg into the cooking butter and cook mine over easy (medium-easy to play it a little safer for baby-squirrel). Using a plastic spatula (metal utensils will scratch and deteriorate the non-stick coating on your pan), I’ll push in and manipulate the size/shape of the frying egg so that it’ll fit nicely on the muffin, even with the egg-over-medium-easy. Carefully flip them after a few minutes, reshaping as needing. Momma Kathy Food Safety Warning: Because this was so strictly enforced when I was growing up, I feel the need to remind you of the salmonella PSA. Raw/undercooked eggs carry a risk of salmonella, which could make you really, horribly, violently sick. There, I said it. You’re welcome, mom. There! Now you know you’ll never get an Egg McMuffin that looks that good (or tastes that fresh), and it only took 15 minutes! Posted in Breakfast, Quick & Easy and tagged bacon, cheese, english muffin, fried egg, tomato. Bookmark the permalink.